Tonight the boys will be finishing building their candy dispenser as part of the Build It Adventure. They made great project last week and we hope to finish this project during this den meeting. I was personally impressed with how well they utilized the tools from the demonstration the week prior. Home Assignment: There are only a few more days remaining. 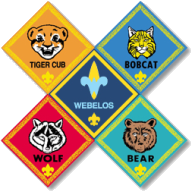 Please complete Webelos Badge Requirements ASAP so they can be presented at the Blue & Gold Banquet (Feb 23). Reminder: Pack building this Saturday.